If you’ve previously played NextGen Gaming’s Volcano Eruption then you’ll be pleased to know that there’s a sequel in the fiery shape of Volcano Eruption Extreme, an online slot which looks outwardly similar to the original but comes with some magma-fuelled enhancements. 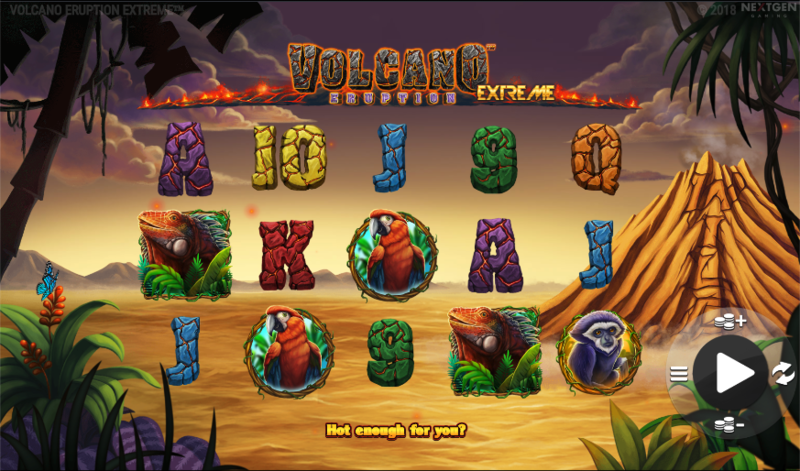 Volcano Eruption Extreme is a five reel slot with three rows and twenty five fixed paylines; those reels spin in front of a barren but tropical landscape on which a threatening volcano squats on the right hand side, belching out black smoke. The higher value symbols include a large lizard, a parrot, some kind of monkey and some orange fruit; 9, 10, J, Q, K and A make up the lower values. The erupting volcano is wild, it appears only on reels two, three and four and it will replace all others to help form winning combos – it’s also the key to the main feature. Every now and then the volcano behind the reels will rumble, freezing a winning combo in place and respinning the remaining reels to try for a better win. The same rumble may also drop wild symbols onto the reels. This is triggered by landing three volcano symbols anywhere on reels two, three and four or by having them dropped onto the reels by the rumbling volcano. However it happens you’ll now receive five free spins with reel three completely wild throughout. During this round extra wilds may be dropped into reels two and four to help out. Unfortunately it’s not possible to trigger any more spins from within this feature. 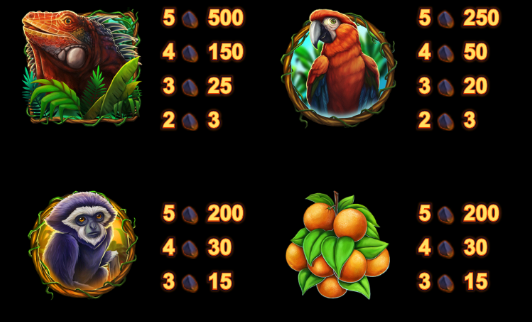 Volcano Eruption Extreme is a high quality slot with a hot theme and a couple of clever features added to the volcanic mix; the big wins seem to be in the free spins round but there’s plenty to enjoy about the whole game.